I know I've mentioned here somewhere how much I love seeing other artists' craft rooms, workbenches, and creative spaces in general. I've been lax in sharing my own as I'm still not sure how this new space will work for me. However, I don't mind sharing my desk. In fact, I'm going to try a recurring feature giving you peeks of what's on my desk through a single day. Now, this can range from beady to crafty to paperwork-y, and that's just in the course of one day! And, because I'm a dork - I have to name it something corny. Like beads rolling across the studio floor, these are the Days of My Craft Desk. 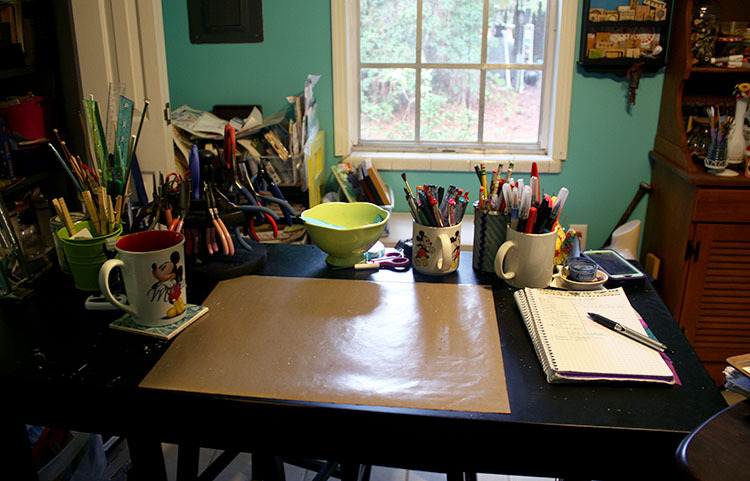 In this first installment, let me start by sharing just how clean and pure my craft desk can be. 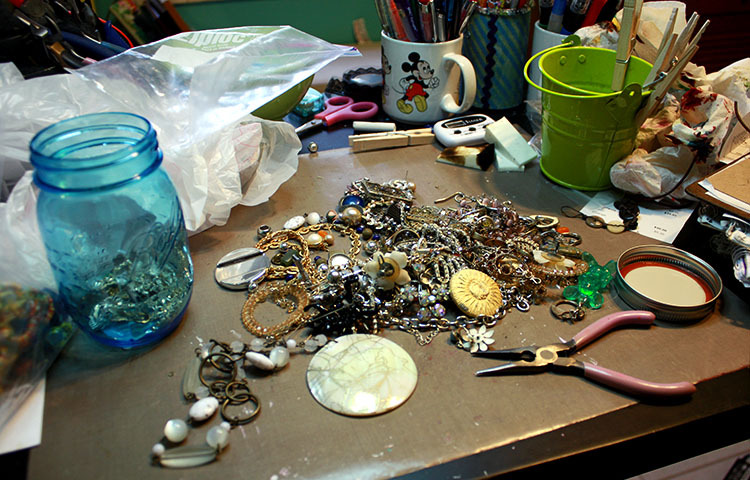 Yet, at other times it's quite dirty - piled high with miscellaneous craft supplies, projects, and general junk. 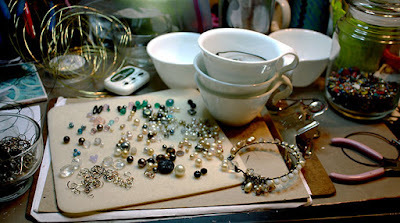 Yesterday's desk was pure beady goodness all day long. 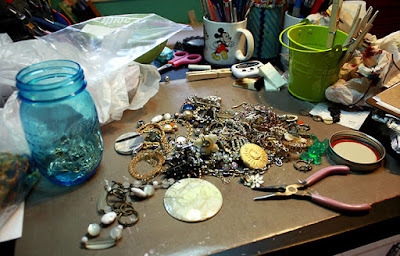 It started out with the sorting of some broken jewelry acquired at an antique store. By mid-day, actual jewelry was being made for a silent auction. After lunch, a large jar of 'bead soup' was sorted into separate palettes for more silent auction projects. 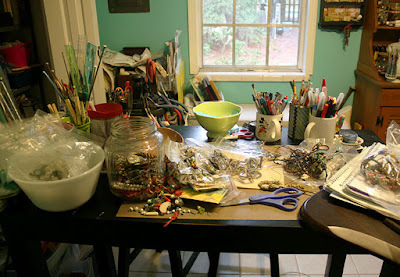 Before the lights went off in the craft room, this was the bead desk's shameful state. Beads were scattered everywhere as bangles were being created from the bead soup palettes. 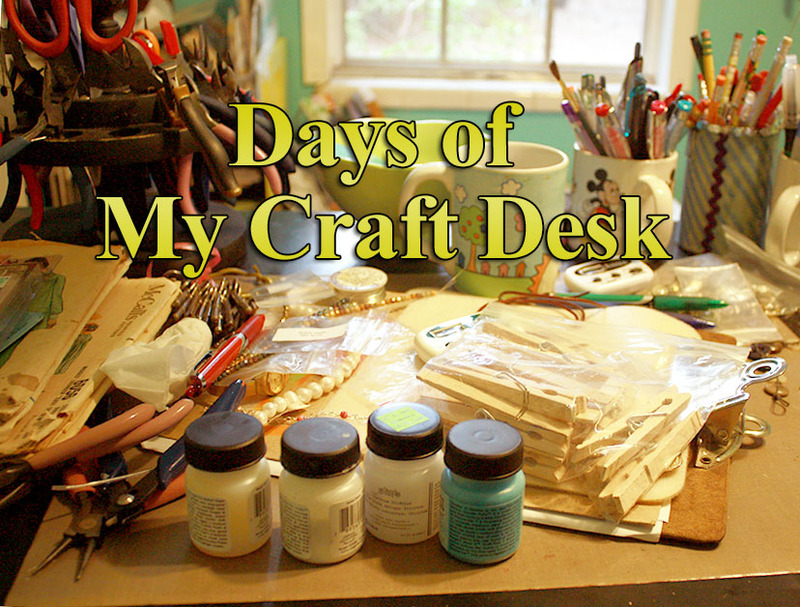 Come back later to see what else happens in Days of My Craft Desk! Ha, see. . . I'm a huge dork, but I like this format so much. I'm sure I'll be sharing many more days. Of course, I'd like to know what you think of it too. Please let me know before I embarrass myself any more! Haha, the Days of My Craft Desk, love it. 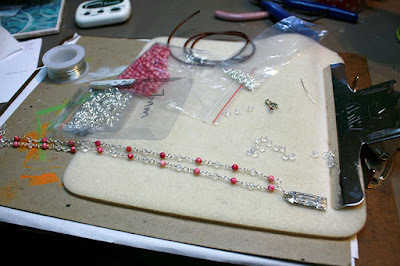 The beady goodness is pretty cool, I admire people that can make jewelry, I just don't have the aptitude for that lol! Thanks for the visit! Never done beads, but looks great. Nothing like having a neat desk to mess up. Funny how easy it is to get in that direction! Kristiina, I do love my beads, but one you start with them it's hard to quit (warning!). Yes, those neat desks don't ever stay that way very long. Ha! Thanks for swinging by! Have fun making new jewelry out of old pieces! Sofie, Oh I do! I adore upcycling and making something new out of the old. Of course, I can't resist new beads and products either. I have a serious craft supply addiction for sure! lol. Yes, I don't know how to work unless there's a mess! Ha! But, I do love my color coordinations. Thanks for popping in! I would be interested to follow these posts, Hope! 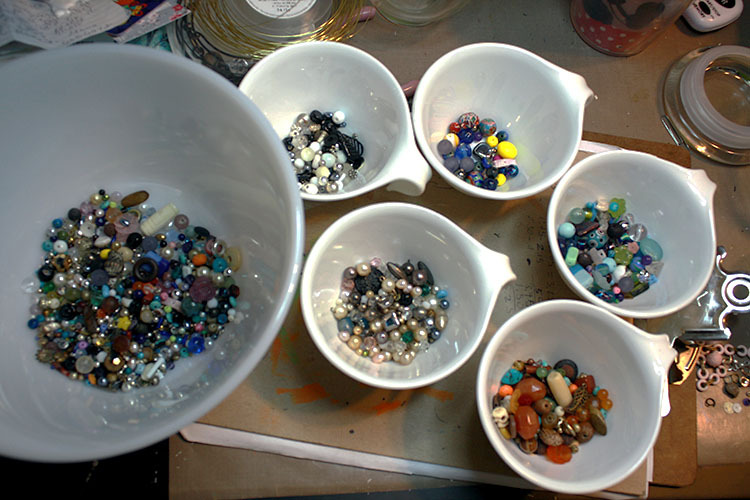 First of all, my working table is always a mess after the first day (I have to clean it sometimes, because it's our dining table for guests) and second, I can always find something for myself like the bead soup cups - I have never tried this method because I like to keep my beads sorted by color and on the strings they come with but it looks like these bead soups can stir your imagination! Hi Hope, I love all your lovely jewellery bits. I made up memory wire beaded bracelets, although not done any for some time. Sue, aw thanks so much! I do enjoy playing with all my bits and baubles. I actually got a memory wire bracelet made yesterday for the first time in a long time myself! They are so fun and quick to make. A silent auction consists of placing the items for sale on display on tables that the buyers can walk around. Next to each item is a sheet of paper on which the buyers can make their bids. Each bid must be higher than the one before. They only have a certain amount of time to browse and bid on the items (usually a few hours). When the time runs out, the person who bid last (highest) gets to pay and take home the item. It's a fairly easy fundraiser as there's not much cost associated with doing one of these. My niece's High School band is doing this one to raise money for their trip to New York. I hope I explained that clear enough. Let me know if you have any other questions! Hi Hope, thanks for visiting my desk and I love your new format. Unfortunately my desk just gets messier and messier and messier as the day goes on. I've still got my improvised light box up as I need to photo what I'm working on and it seems a waste of time to take down and put up again. LOL, if only there was a nice space with good natural light......Happy WOYWW, Cindyxx #30 - Oh and if you ae a newbie to WOYWW welcome - haven't been around a lot lately so apologise if you are a regular!! To funny that you were on my blog just as I got on yours! Gratz on your first WOYWW! I love the subtitle! And your beading projects look lovely; I love the look and idea of beading, but just do not have the patience! Happy WOYWW and thanks for visiting. Hello Hope. I love your desk.I'm a messy worker too, but I like to start out tidy.If too messy it puts me off. Just wanted to say how much I appreciated your comment on my drawings. It is hard to show things you aren't confident with, but this course is just so joyful, and each time I do something I feel more and more happy with it. I think drawing is a powerful way too make a person more observant and peaceful.I am doing 4 of Joanne's classes at once! Just love her style.I'm a new follower too. This is so so great! I'm always amazed when I pull off a "clean desk moment". Those can be like your little commercial breaks! ;) I can't wait to follow along. It's impossible to be neat and creative at the same time! It's great see your work desk before and after. Happy WOYWW! Hi Hope, love your beads, I think beads come a close second to buttons with me. I don't use enough of either of them in my projects but I just keep collecting them. Hi Hope, I don't think your title is corny I think it is creative. I always enjoy seeing other people's creative spaces and hearing about their process. Becky, You and me both! I know if something grabs my attention, it's other people's spaces for sure. I'm nosy like that! I'm relieved to know I'm not the only one and that I have your support of my 'corny' idea ;) Thank you! !